Louis Riel Day display at Fergus Highschool. 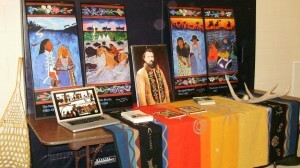 Métis Historical Events . . . Every year, Canadians commemorate the death of Louis Riel on November 16th*. I talk about the Battle of Batoche, the hanging of Louis Riel and the North-West Resistance of 1885. The federal government designated 2010 “The Year of the Metis“, to mark the 125th anniversary of this tragic event in Canadian history. So it is important to know and understand its impact on Métis people. I also use songs and ballads as a way to tell the stories. In my displays for this, I use four beautifully illustrated panels by Métis Artist Sherry Farrell Racette that depict the four periods of Métis history. Also includes plenty of hands-on artifacts and items (see Métis History Display for more details). An original painting of Louis Riel by Métis artist Dennis Weber, also adds handsomely to the display. 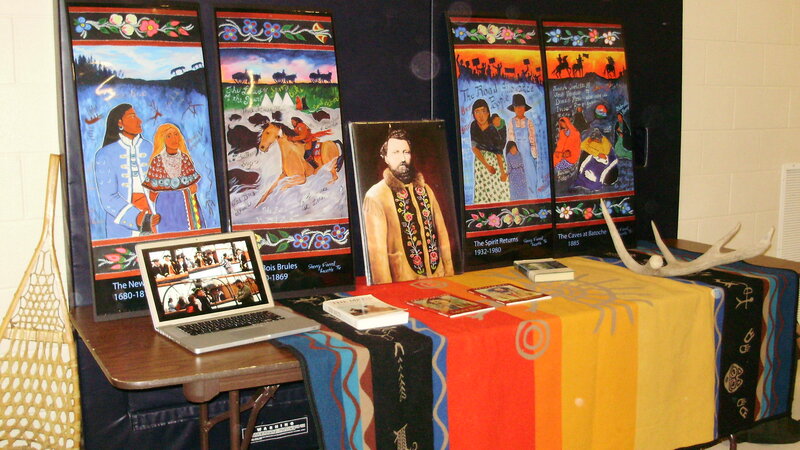 *LOUIS RIEL DAY EVENTS – URBAN ABORIGINAL TV series. ” Riel – visionary or madman?” Be part of the discussion!